Hello, Michael C. Bazarewsky here again, with another short clarification post. But I was curious – what was the driving factor behind this deprecation? After all, you’d expect that if features improve performance reliably, and are in heavy use, we wouldn’t deprecate them, right? Well, it turns out, by phrasing the question that way, I’ve walked you down the garden path a bit. I reached out internally, and found out some interesting information that I’m not sure was particularly widely known, although you can see hints of it. Before explaining why they are deprecated, though, I should explain what each of these features did, in theory, to explain why they were ever listed as features at all. After all, you can’t really understand the implications of a change without understanding the original state, right? If there is a flaw in the TCP implementation in the network card, for example a security issue, you are potentially looking at a firmware update on the network card, or worse, you may be stuck with it, depending on the card implementation and the vendor’s support policy for the network card. Under heavy network loads, performance may actually drop, because you’re limited to the resources on the network card, which may be a bottleneck relative to a fast operating system stack with fast, available processor cores. The cost for all TCP connection offloading is fixed; there’s no way for the operating system to optimize specific use cases. The feature assumes that the fixed cost will be offset by the CPU savings, thus there will be an overall improvement in performance. However, improvements in processor performance combined with what real-life TCP workloads look like suggest that, in 2017, ~99% of real-life connections will send enough data for the performance arithmetic to work out. The NIC code wasn’t necessarily written with TCP in mind; thus, not all TCP features are implemented. For example, the TCP performance enhancement known as Selective Acknowledgement (RFC 2018, from 1996 [!! ]), can’t be used with TCP Chimney. Very few users actively used TCP Chimney support. Very few network cards implemented the functionality. Over time, less and less customers cared, and less and less NICs offered the ability. In the Windows 7 / Windows Server 2008 R2 timeframe, we found that the number of customer support cases around this dropped to zero. In Windows 8 / Windows Server 2012, we changed the operating system to disable this functionality by default. There was not a customer pushback on this. The industry in general has decided this is not a necessary feature. For example, the Linux kernel has never implemented this capability, although some specific network card drivers did implement it, generally poorly. You do not need to take my word for this – the Wikipedia article on TCP Offload covers it sufficiently. Thus, the end result of all of this is that the TCP Chimney deprecation in Windows 10 Creators Update is really not a new thing, because disabling it by default was a signal of the future direction. Furthermore, there are no current mainstream network cards that implement this feature, and customers are not reporting a need for this functionality. So, although deprecation of a feature is something customers generally need to be aware of and plan for, in this case, that’s not a real life concern. But what about the second deprecated feature, IPsec Task Offload? Well, this is another case of the concept of transferring computing responsibility from the host processor to the network card. However, this is not basic processing of TCP packets in this case. Instead, IPsec Task Offload, as the name implies, moves the encryption and decryption tasks for network data protected with IPsec to the network card. As you can imagine, this also requires a smarter network card, with more complicated firmware. Thus, all of the issues around updates and patches that were present for TCP Chimney are also present here. Further, because the whole point of IPsec is to secure network communications, security issues are arguably more critical to correct in this scenario. Management of IPsec secrets can be complicated, and needing to interact with the network card to manage those adds another layer of complexity. Conceptually, IPsec is a critical security feature in environments where it is used. All vulnerabilities that may exist are essentially critical vulnerabilities by definition; thus, the ability to quickly deploy changes is critical. As a major operating system vendor offering IPsec functionality, Microsoft has the dedicated security staff and deployment capability (with Windows Update) to make this happen. 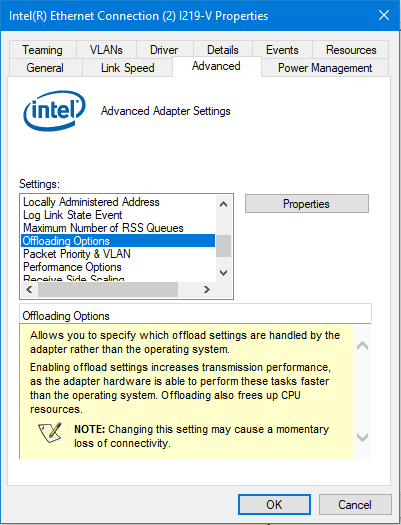 Only one certified network card – an older Intel card – ever implemented this feature fully. No modern shipping mainstream network cards implement this functionality. Over time, the industry appears to be moving to TLS over IPsec for many use cases, such as VPN solutions, thus lowering the importance of IPsec workloads on Windows machines. You may notice one of those points – the point around the number of support cases – is a duplicate from the list for TCP Chimney. This is not a coincidence. In both cases, it’s clear from customer interaction that real-world impact of deprecation of these features will be near zero. And, as mentioned above, because deprecation is not the same as removal – the whole point of deprecation is to act as a customer warning point and allow reaction from the user community and ensure that we aren’t missing something or breaking existing environments – there’s always the chance for us to be proven wrong on this. p.p.s. special thanks to Daniel Havey, Mihai Peicu, Praveen Balasubramanian, Don Stanwyck, and Doug Stamper for technical review assistance and background information! Will it also be removed in Server 2016 (1703 or above)? The situation is the same in Server 2016 as well – deprecated, not yet removed, and disabled by default. Why the “[!! ]” after 1996? Proper network ID and broadcast address assignment for Classless Inter-Domain Routing was not properly implemented in windows until Win7 SP1 / 2008 R2 (i.e. late-summer 2009), even though RFC 1518 came out years before Win95 (the first version of windows to come with a TCP stack) was released, so it’s not like Redmond has a track record of promptly fixing reported networking problems in windows, anyway. The likely answer? The guy is probably in his 30s at the latest and to him the very concept of a piece of technology, hardware or software, still being used today is just blasphemy. I truly believe what’s happening over at Microsoft is just a team of nu-male young millennials coming in and sweeping the rug out from Windows, replacing and removing as much of the old guard’s work to put their own content up on the shelves to show off. There have been so many needless and pointless deprecations and outright removals of aspects of Windows that are without any real benefit to get rid of, but can be of use to fringe case users. Surprise surprise. TCP offloading is still functional here in the Creators Update of Windows 10 and is still of benefit. Removing features like this is just asinine and pompous flaunt of young blood attempts at standing above the crowd, making a name for themselves. I’m absolutely disgusted. Intel 10G NICs implement IPSec offload, although the shipping driver may not support it.